John Georgelas is an American convert to Islam who traveled to Syria to fight for ISIS in 2013 and became “the most important and prominent American” in the group, according to Graeme Wood, writing for the Atlantic.Graeme Wood, “The American Climbing the Ranks of ISIS,” Atlantic, updated January 25, 2017, https://www.theatlantic.com/magazine/archive/2017/03/the-american-leader-in-the-islamic-state/510872/; Graeme Wood, “The American Climbing the Ranks of ISIS: An Update,” Atlantic, December 16, 2016, https://www.theatlantic.com/international/archive/2016/12/american-leader-islamic-state-update/510998/. Before joining ISIS, he amassed a following from his extensive scholarly writings on jihadist subjects, which he published online. Reportedly close to members of ISIS’s leadership, including former ISIS spokesperson Abu Muhammad al-Adnani, Georgelas allegedly pushed ISIS to declare a caliphate in 2014. Since then, he has become ISIS’s “leading producer of high-end English-language propaganda,” according to the Atlantic, appearing on the group’s Al Bayan radio station and contributing to its English-language magazines, Dabiq and Rumiyah.Graeme Wood, “The American Climbing the Ranks of ISIS,” Atlantic, updated January 25, 2017, https://www.theatlantic.com/magazine/archive/2017/03/the-american-leader-in-the-islamic-state/510872/. Georgelas was born in December 1983 to an upper-middle-class family in Plano, Texas, although his family moved several times during his childhood because of his father’s military assignments. At eleven years old, he reportedly became interested in religion and joined the Greek Orthodox Church. According to his family, he was a troublemaker in school and drug user. His academic performance was poor, although he graduated from high school and briefly attended community college.Graeme Wood, “The American Climbing the Ranks of ISIS,” Atlantic, updated January 25, 2017, https://www.theatlantic.com/magazine/archive/2017/03/the-american-leader-in-the-islamic-state/510872/. In November 2001, Georgelas converted to Islam and adopted the name Yahya. One month later, he traveled to Damascus, Syria, to study Arabic. While there, he met some British Muslims who introduced him to jihadism.Graeme Wood, “The American Climbing the Ranks of ISIS,” Atlantic, updated January 25, 2017, https://www.theatlantic.com/magazine/archive/2017/03/the-american-leader-in-the-islamic-state/510872/. In March 2003, Georgelas flew to London to meet a Muslim woman named Tania Choudhury with whom he had been communicating online.Graeme Wood, “The American Climbing the Ranks of ISIS,” Atlantic, updated January 25, 2017, https://www.theatlantic.com/magazine/archive/2017/03/the-american-leader-in-the-islamic-state/510872/; Barbara Davies, “Has the British beauty who fled her ISIS leader husband for Texas REALLY cut all ties with one of the world's most wanted terrorists?” Daily Mail (London), January 13, 2017, http://www.dailymail.co.uk/news/article-4118570/Has-British-beauty-fled-ISIS-leader-husband-Texas-REALLY-cut-ties-one-world-s-wanted-terrorists.html. They married days later and settled together in College Station, Texas. The couple also spent time living in Syria, London, and California, throughout the following year. During this time, Georgelas became obsessed with studying and writing about Islamic history, theology, and jihad.Graeme Wood, “The American Climbing the Ranks of ISIS,” Atlantic, updated January 25, 2017, https://www.theatlantic.com/magazine/archive/2017/03/the-american-leader-in-the-islamic-state/510872/. Georgelas and his wife moved from California back to Texas, where he began working as a data technician at Rackspace. In his spare time, he reportedly frequented jihadist forums online. Around 2006, he reportedly intended to travel to Iraq to wage jihad against American forces, but these plans were thwarted after he attempted to hack the website of the American Israel Public Affairs Committee—a client of Rackspace—on April 8, 2006.Graeme Wood, “The American Climbing the Ranks of ISIS,” Atlantic, updated January 25, 2017, https://www.theatlantic.com/magazine/archive/2017/03/the-american-leader-in-the-islamic-state/510872/. The FBI arrested Georgelas on April 14 for intentionally accessing a protected computer without authorization. He pled guilty and was sentenced to 34 months in prison in August.“Former Data Technician at Local Internet Hosting Company and Self-Admitted Supporter of Pro-Jihad Website Sentenced to 34 Months for Attempting to Cause Damage to a Protected Computer,” U.S. Department of Justice, August 15, 2006, https://www.justice.gov/archive/usao/txn/PressRel06/georgelas_john_sen_pr.html; Graeme Wood, “The American Climbing the Ranks of ISIS,” Atlantic, updated January 25, 2017, https://www.theatlantic.com/magazine/archive/2017/03/the-american-leader-in-the-islamic-state/510872/. Following his release from prison, Georgelas remained under parole until October 2011 and worked as an IT specialist. After his parole expired, he moved to Cairo, Egypt, with his wife and children, where he made a living translating the fatwas of Qatari religious scholars. Georgelas began to amass a global following of extremists who admired his scholarly work, which he promoted online. He operated a website focused on Dhahirism––a semi-obscure literalist form of Islam––where he regularly published his own and others’ extremist rhetoric and held online seminars. According to an acquaintance, he was one of the strongest “pre-ISIS pro-caliphate voices.”Graeme Wood, “The American Climbing the Ranks of ISIS,” Atlantic, updated January 25, 2017, https://www.theatlantic.com/magazine/archive/2017/03/the-american-leader-in-the-islamic-state/510872/. In August 2013, Georgelas moved his wife and children to Azaz, Syria, in the midst of the country’s civil war. After a month, his family left Georgelas permanently to return to the United States. Following their departure, Georgelas trained with an ISIS-affiliated group near Aleppo, then participated in combat. However, he was severely injured by a mortar blast in April 2014, which left him unable to walk for some time. While recovering, Georgelas continued to update his website and became active on social media, where he posted pro-ISIS content. Georgelas was reportedly close with members of ISIS’s leadership, including former spokesperson and second-highest ranking ISIS leader Abu Muhammad al-Adnani. 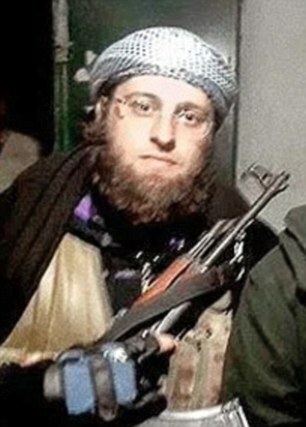 Georgelas reportedly pressed Adnani to pressure ISIS emir Abu Bakr al-Baghdadi to declare a caliphate. Once ISIS publicly declared its caliphate in June 2014, Georgelas pledged his allegiance to Baghdadi.Graeme Wood, “The American Climbing the Ranks of ISIS,” Atlantic, updated January 25, 2017, https://www.theatlantic.com/magazine/archive/2017/03/the-american-leader-in-the-islamic-state/510872/. Georgelas was taken prisoner by the Free Syrian Army, but was eventually released after he reportedly feigned cooperation. In 2015, he traveled to ISIS’s de facto capital of Raqqa, where he was accepted as a scholar and spokesman for the group. Georgelas was first heard on ISIS’s Al Bayan radio station in December 2015, and in April 2016, wrote an article titled “Kill the Imams of Kufr [Disbelief] in the West” for ISIS’s English-language propaganda magazine, Dabiq.Graeme Wood, “The American Climbing the Ranks of ISIS,” Atlantic, updated January 25, 2017, https://www.theatlantic.com/magazine/archive/2017/03/the-american-leader-in-the-islamic-state/510872/. Georgelas has since written extensively for both Dabiq and its successor, Rumiyah. In December 2016, four months after Adnani was killed in a drone strike, ISIS named its new spokesperson as “Abu al-Hassan al-Mujahir”––a name similar to a known alias of Georgelas’s, Abu Hassan al-Mujahir. Although the Atlantic speculated that Georgelas might be the new spokesperson, there has been no further evidence to suggest this possibility. Nonetheless, the Atlantic asserts that Georgelas remains the “most important and prominent American” in ISIS.Graeme Wood, “The American Climbing the Ranks of ISIS,” Atlantic, updated January 25, 2017, https://www.theatlantic.com/magazine/archive/2017/03/the-american-leader-in-the-islamic-state/510872/. Abu Hassan al-MuhajirGraeme Wood, “The American Climbing the Ranks of ISIS: An Update,” Atlantic, December 16, 2016, https://www.theatlantic.com/international/archive/2016/12/american-leader-islamic-state-update/510998/. Al-BahrumiGraeme Wood, “The American Climbing the Ranks of ISIS: An Update,” Atlantic, December 16, 2016, https://www.theatlantic.com/international/archive/2016/12/american-leader-islamic-state-update/510998/. Al-GhurabiGraeme Wood, “The American Climbing the Ranks of ISIS: An Update,” Atlantic, December 16, 2016, https://www.theatlantic.com/international/archive/2016/12/american-leader-islamic-state-update/510998/. Ioannis GeorgilakisGraeme Wood, “The American Climbing the Ranks of ISIS: An Update,” Atlantic, December 16, 2016, https://www.theatlantic.com/international/archive/2016/12/american-leader-islamic-state-update/510998/. John Thomas GeorgelasGraeme Wood, “The American Climbing the Ranks of ISIS,” Atlantic, updated January 25, 2017, https://www.theatlantic.com/magazine/archive/2017/03/the-american-leader-in-the-islamic-state/510872/. YahyaGraeme Wood, “The American Climbing the Ranks of ISIS,” Atlantic, updated January 25, 2017, https://www.theatlantic.com/magazine/archive/2017/03/the-american-leader-in-the-islamic-state/510872/. Yahya Abu HassanGraeme Wood, “The American Climbing the Ranks of ISIS,” Atlantic, updated January 25, 2017, https://www.theatlantic.com/magazine/archive/2017/03/the-american-leader-in-the-islamic-state/510872/. Yahya al-BahrumiGraeme Wood, “The American Climbing the Ranks of ISIS: An Update,” Atlantic, December 16, 2016, https://www.theatlantic.com/international/archive/2016/12/american-leader-islamic-state-update/510998/. Yahya al-GhurabiGraeme Wood, “The American Climbing the Ranks of ISIS: An Update,” Atlantic, December 16, 2016, https://www.theatlantic.com/international/archive/2016/12/american-leader-islamic-state-update/510998/. Yahya of the Roman SeaGraeme Wood, “The American Climbing the Ranks of ISIS,” Atlantic, updated January 25, 2017, https://www.theatlantic.com/magazine/archive/2017/03/the-american-leader-in-the-islamic-state/510872/. Yahya the MediterraneanGraeme Wood, “The American Climbing the Ranks of ISIS,” Atlantic, updated January 25, 2017, https://www.theatlantic.com/magazine/archive/2017/03/the-american-leader-in-the-islamic-state/510872/. “So you can continue to believe that those ‘despicable terrorists’ hate you because of your lattes and your Timberlands, and continue spending ridiculous amounts of money to try to prevail in an unwinnable war, or you can accept reality and recognize that we will never stop hating you until you embrace Islam.”“Why We Hate You & Why We Fight You,” Dabiq, May 2016, 33, https://azelin.files.wordpress.com/2016/04/the-islamic-state-22dacc84biq-magazine-1422.pdf; Graeme Wood, “The American Climbing the Ranks of ISIS,” Atlantic, updated January 25, 2017, https://www.theatlantic.com/magazine/archive/2017/03/the-american-leader-in-the-islamic-state/510872/. “Your secular liberalism has led you to tolerate and even support ‘gay rights,’ to allow alcohol, drugs, fornication, gambling, and usury to become widespread, and to encourage the people to mock those who denounce these filthy sins and vices. As such, we wage war against you to stop you from spreading your disbelief and debauchery – your secularism and nationalism, your perverted liberal values, your Christianity and atheism – and all the depravity and corruption they entail.”“Why We Hate You & Why We Fight You,” Dabiq, May 2016, 32, https://azelin.files.wordpress.com/2016/04/the-islamic-state-22dacc84biq-magazine-1422.pdf; Graeme Wood, “The American Climbing the Ranks of ISIS,” Atlantic, updated January 25, 2017, https://www.theatlantic.com/magazine/archive/2017/03/the-american-leader-in-the-islamic-state/510872/. “Shortly following the blessed attack on a sodomite, Crusader nightclub by the mujahid Omar Mateen, American politicians were quick to jump into the spotlight and denounce the shooting, declaring it a hate crime, an act of terrorism, and an act of senseless violence. A hate crime? Yes. Muslims undoubtedly hate liberalist sodomites, as does anyone else with any shred of their fitrah (inborn human nature) still intact. An act of terrorism? Most definitely. Muslims have been commanded to terrorize the disbelieving enemies of Allah. But an act of senseless violence? One would think that the average Westerner, by now, would have abandoned the tired claim that the actions of the mujahidin – who have repeatedly stated their goals, intentions, and motivations – don’t make sense. Unless you truly – and naively – believe that the crimes of the West against Islam and the Muslims, whether insulting the Prophet, burning the Quran, or waging war against the Caliphate, won’t prompt brutal retaliation from the mujahidin, you know full well that the likes of the attacks carried out by Omar Mateen, Larossi Aballa, and many others before and after them in revenge for Islam and the Muslims make complete sense. The only thing senseless would be for there to be no violent, fierce retaliation in the first place!”“Why We Hate You & Why We Fight You,” Dabiq, May 2016, 30, https://azelin.files.wordpress.com/2016/04/the-islamic-state-22dacc84biq-magazine-1422.pdf; Graeme Wood, “The American Climbing the Ranks of ISIS,” Atlantic, updated January 25, 2017, https://www.theatlantic.com/magazine/archive/2017/03/the-american-leader-in-the-islamic-state/510872/. “Though their kufr was apparent to those who recognized it years ago, they became even more ardent and blatant defenders of the crusaders after the Khilā- fah was reestablished, uniting with their cross-bearing allies in the global war against the Islamic State, the only true bastion of Sharī’ah rule on earth.”“Kill the Imams of Kufr in the West,” Dabiq, April 2016, 13, https://azelin.files.wordpress.com/2016/04/the-islamic-state-22dacc84biq-magazine-1422.pdf; Graeme Wood, “The American Climbing the Ranks of ISIS,” Atlantic, updated January 25, 2017, https://www.theatlantic.com/magazine/archive/2017/03/the-american-leader-in-the-islamic-state/510872/. “It should then be no surprise that [Abu Bakr al-Baghdadi] declared that any of the apostates from the sahwāt or otherwise who repent to Allah and surrender themselves to the Islamic State will be guaranteed amnesty, even if they had killed a million mujāhidīn. But those who are caught before they repent, then there is no amnesty for them and theirs shall be a painful – and fatal – punishment.”“Kill the Imams of Kufr in the West,” Dabiq, April 2016, 9, https://azelin.files.wordpress.com/2016/04/the-islamic-state-22dacc84biq-magazine-1422.pdf; Graeme Wood, “The American Climbing the Ranks of ISIS,” Atlantic, updated January 25, 2017, https://www.theatlantic.com/magazine/archive/2017/03/the-american-leader-in-the-islamic-state/510872/.